A variety of mold cleanup methods are available for remediating damage to building materials and furnishings caused by moisture control problems and mold growth. The specific method or group of methods used by Restorative Cleaning Solutions' remediators will depend on the types of material affected. Please note that Restorative Cleaning Solutions' professional remediators may use some methods not covered in these guidelines as there a always technological remediation advancement that are not regularly updated on site. Wet vacuums are vacuum cleaners designed to collect water. They can be used to remove water from floors, carpets, and hard surfaces where water has accumulated. They should not be used to vacuum porous materials, such as gypsum board. They should be used only when materials are still wet -- wet vacuums may spread spores if sufficient liquid is not present. The tanks, hoses, and attachments of these vacuums should be thoroughly cleaned and dried after use since mold and mold spores may stick to the surfaces. Whether dead or alive, mold is an allergenic, and some molds are also toxic. Mold can generally be removed from nonporous (hard) surfaces by wiping or scrubbing with our fungicidal solutions. 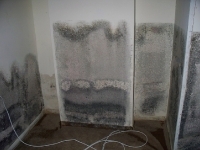 Our remediators then speed dry all surfaces thoroughly to discourage further mold growth. Porous materials that are wet and have mold growing on them may have to be discarded. Since molds will infiltrate porous substances and grow on or fill in empty spaces or crevices, the mold can be difficult or impossible to remove completely. Our team will carfully remove and bag all unslvagable porous materials and remove from site carefully as to not contaminate non effected areas. HEPA (High-Efficiency Particulate Air) vacuums are recommended for final cleanup of remediation areas after materials have been thoroughly dried and unsalvagable contaminated materials removed. HEPA vacuums are also recommended for cleanup of dust that may have settled on surfaces outside the remediation area. Our team of remediators take care to assure that all traces of contamination is properly and completely removed during this stage. The purpose of mold remediation is to remove the mold to prevent human exposure and damage to building materials and furnishings. It is ultimately necessary to clean up mold contamination, not just to kill the mold - but to protect the health of people living in the space. Dead mold is still allergenic, and some dead molds are potentially toxic. Capital Restoration Team use's disinfectants and biocides and we always ventilate the area we are disinfecting. We bring in outdoor air with fans. When using fans and take extra precautions not to distribute mold spores throughout all unaffected areas. Is sampling for mold needed? In most cases, if visible mold growth is present, sampling is unnecessary. In specific instances, such as cases where litigation is involved, the source(s) of the mold contamination is unclear, or health concerns are a problem, you may consider sampling as part of your site evaluation. Surface sampling may also be useful in order to determine if an area has been adequately cleaned or remediated. Sampling should be done only after developing a sampling plan that includes a confirmable theory regarding suspected mold sources and routes of exposure. Figure out what you think is happening and how to prove or disprove it before you sample! If you do not have extensive experience and/or are in doubt about sampling, consult an experienced professional. This individual can help you decide if sampling for mold is useful and/or needed, and will be able to carry out any necessary sampling. It is important to remember that the results of sampling may have limited use or application. Sampling may help locate the source of mold contamination, identify some of the mold species present, and differentiate between mold and soot or dirt. Pre- and post-remediation sampling may also be useful in determining whether remediation efforts have been effective. After remediation, the types and concentrations of mold in indoor air samples should be similar to what is found in the local outdoor air. Since no EPA or other Federal threshold limits have been set for mold or mold spores, sampling cannot be used to check a building's compliance with Federal mold standards. Sampling for mold should be conducted by professionals with specific experience in designing mold sampling protocols, sampling methods, and interpretation of results. Sample analysis should follow analytical methods recommended by the American Industrial Hygiene Association (AIHA), the American Conference of Governmental Industrial Hygienists (ACGIH), or other professional guidelines. Types of samples include air samples, surface samples, bulk samples (chunks of carpet, insulation, wall board, etc. ), and water samples from condensate drain pans or cooling towers. A number of pitfalls may be encountered when inexperienced personnel conduct sampling. They may take an inadequate number of samples, there may be inconsistency in sampling protocols, the samples may become contaminated, outdoor control samples may be omitted, and you may incur costs for unneeded or inappropriate samples. Budget constraints will often be a consideration when sampling; professional advice may be necessary to determine if it is possible to take sufficient samples to characterize a problem on a given budget. If it is not possible to sample properly, with a sufficient number of samples to answer the question(s) posed, it would be preferable not to sample. Inadequate sample plans may generate misleading, confusing, and useless results. Keep in mind that air sampling for mold provides information only for the moment in time in which the sampling occurred, much like a snapshot. Air sampling will reveal, when properly done, what was in the air at the moment when the sample was taken. For someone without experience, sampling results will be difficult to interpret. Experience in interpretation of results is essential. Capital Restoration Team does not take samples or reccomend sampling professionals due to our ethical beliefs. We suggest hiring an independant hygienist to samle space before and after our remediation process. CALL NOW FOR PROFESSIONAL REMEDIATION. 1-800 790-0090. Copyright © 2019 Capital Restoration Services, Inc. All Rights Reserved.